The author reflects back on what six years of the Realm Makers conference has meant to him. The irony up front of this article is while it will be published Thursday morning during the Realm Makers Conference, I’m writing it before that, before going to the conference. So while this article coincides with the 6th year of RM, it can’t say anything meaningful about this year’s event. Except that it will be in St. Louis, as the first Realm Makers was. And I can also say that I’ve been to all six Realm Makers and will be at this one as well (God willing). The first Realm Makers was a small event, but I met some amazing people there. Jeff Gerke, Brian Davis, and Kathy Tyers were only the better-known ones. I also met a lot of people I had already been working with on various projects, like Grace Bridges and Kat Heckenbach. And of course, Becky and Scott Minor–and Ben Wolf. Through the years I’ve met other people, so many I can’t remember now which Realm Makers I was at when I met them. I’d start dropping names (Kerry Nietz and E. Stephen Burnett would be at the top of any such list), but I know I will forget people whom I don’t wish to forget, so maybe it’s better I don’t launch into a massive list after all. But there’s this weird aspect of meeting people in person at Realm Makers you know from online (which would of course apply to similar conferences as well)–some people are nicer to spend time with than you would ever imagine, some people are actually not as nice as you thought, and some people live up to what you thought was true. This experience is especially poignant at Realm Makers for me, because unlike a number of other attendees, RM is the only writer’s conference of any kind that I’ve ever attended. 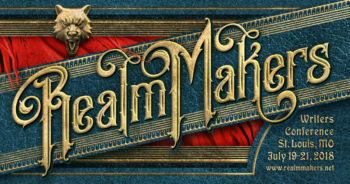 Professionally, Realm Makers has been a huge part of my life as an author and now a publisher. 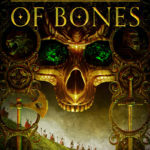 I’ve done a lot of joint writing projects and a great many of the writers I work with on anthologies and other projects I’ve met at Realm Makers. 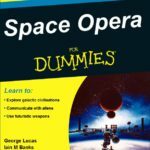 That includes Lelia Rose Foreman’s Writing Speculative Fiction books and many of the Mythic Orbits story authors, and the Medieval Mars and Victorian Venus books and Kristin Stieffel’s Tales of the Phoenix book (in that same story universe as MM and VV). All these collaborative projects became possible at least in part as a result of going to this conference for six years in a row. How I spend my time at the conference has shifted over the years. 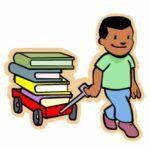 I’m more interested in mentoring others and hearing pitches for their works, and more interested in networking with other authors and just spending time together, than I am interested in keynote speakers or the educational content of the conference itself. Not that there’s anything wrong with that content–it’s taught me some valuable things. I’ve just found the networking and the planning of new projects to be more personally valuable to me than any content that has been taught. Will I keep going to this conference, over and over for years to come? I don’t honestly know. I think so, but perhaps over time this will no longer be my one-and-only conference. Perhaps I may attend something with a different approach as to content or audience–or a regional conference. But even if I also go elsewhere in the future, I’m definitely a Realm Makers alumnus. The conference has shaped my life as a writer and a publisher in a number of ways. So thank you, Becky, Scott, and Ben. And all others, a host of you, who have contributed to this conference in a meaningful way. I really have appreciated your efforts. 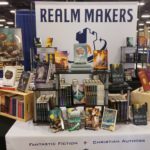 For the general public reading here, what are your thoughts on the Realm Makers Conference? If you’ve attended, what are your favorite aspects? Favorite memories? If you haven’t, do you plan to in the future? Why or why not? I went for the first time this year. Did we meet? I apologize if I am not recalling it. I was struck by the open-heart spirit of its attendees. People were so open about their faith, their interests, their struggles. Many observed that the fellowship there felt “like church.” In wondering why, I tend to think it is because the attendees are generally folks who find it hard to fit into other molds but feel at home among the target audience of Realm Makers. The labels are absent, yet it is a safe space for writers to speak life into each other and our craft. Perhaps the predominant characteristic attendees have in common is that we are all fans of wonder, and wonder is simply a child-like worship of God, which pleases Him. I really enjoyed it.